Mark is addicted to The Grill Room, and he’s hardly apologetic about it. We figured out that since moving to Portland in January 2010, we have eaten there nine times. That’s nine times I would have rather tried somewhere new, but sometimes love means compromise (me) and never having to say your are sorry for loving meat (him). That is not to say though, that I don’t equally love this place. It was actually the first restaurant we ever went to in Portland together, so it has such a special place in my heart for that. I have read the reviews and I know not everyone holds it in such high regard, but I have honestly, in all those times never had a bad meal there, until now. We stepped into The Grill Room on beautiful fall evening at 6:30. We wanted to get some grub before the Steelers game came on at 8:00, and I’ll admit that I was just too lazy to cook. When we walked in there was hardly anyone in the restaurant. This was a new scene to witness as there are usually no tables in the whole place, but I suppose everyone was busy at a bar or their house watching the Patriots lose to the Giants. We, on the other hand, were poised to enjoy unobstructed views of the fall of the house of Brady while having a gourmet burger. One thing I really love about The Grill Room, is that while they are known for their steaks, they also have excellent seafood as well. All of their meat is also locally sourced from Pineland Farms and grass-fed to boot (this is my preemptive apology to those of you who worship at the church of corn-fed beef, but green grass is not only healthier, but tastier too in my opinion)! So, having eaten there more times than is really necessary for any sane human to do in less than two years time span, we decided to go and try out menu items we have always wanted, but have never ordered. 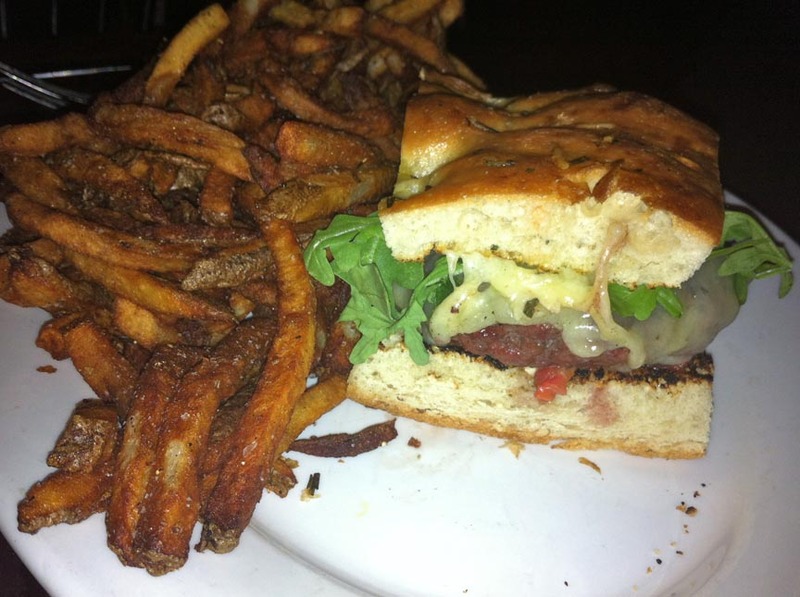 For Mark this meant their Gourmet Pineland Farms Burger, seared to a perfect medium-well. It was oozing with juicy deliciousness, topped with cheddar (also Pineland Farms), arugula, and homemade aioli. Simply spectacular. I think I heard an angel trumpet when I snuck a bite! The side of sea-salted fries that came with it were a meal in and of themselves. There were simply so many it was disturbing, but in a deliciously gluttonous way. Mark took some home to enjoy during the game. I had been eying up the duck and brie pizza since about our second visit, but had never had the heart to order it over any of the other beloved seafood dishes that I have had there (the trout there is simply unbelievable. If you can drag yourself away from their steaks you should try it. You will not be disappointed). This was actually quite awful. 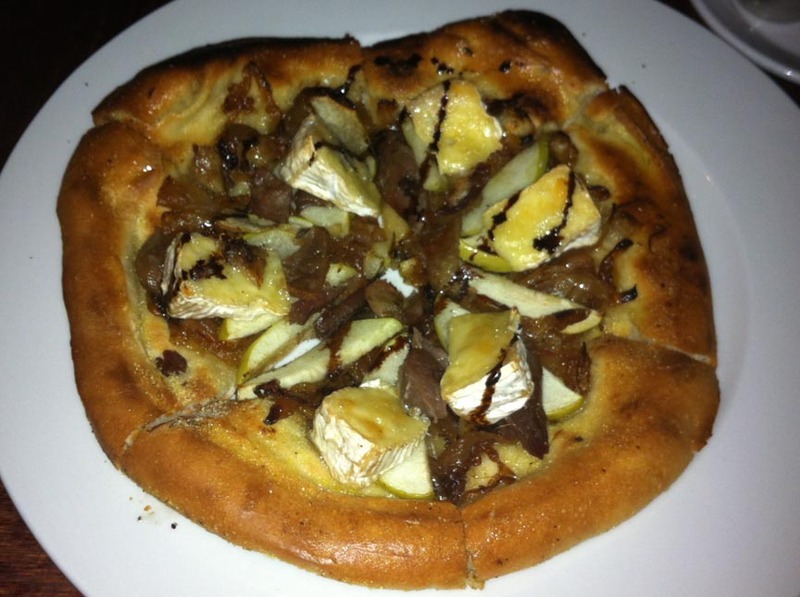 Duck confit, brie, apples, and caramelized onions all with a balsamic drizzle on top. Sounds like it would be divine, but I assure you, this is not made with the same love that their grilled items are. Obviously, it was my irrational mistake; if someplace calls themselves The Grill Room, don’t order brick oven pizza there. The duck was so dry, I couldn’t tell if it had been confited earlier in the day, or earlier this year. It was absolutely horrible. The brie tasted like Président brand from Hannford, which I will admit, I have eaten, but come on! I expected something of a somewhat higher quality here. The dismal balsamic drizzle added little to the whole preparation. The apples and caramelized onions, also left tons to be desired. The apples were far too undercooked, while the onions were wilty and lacking in any onion flavor (which I am still trying to figure out how that was even possible). The whole pizza was a complete and utter failure on their part. I would never order this again or suggest it to anyone—in fact, I propose they remove all pizzas from their menu effective yesterday to save anyone else from making as horrific of a mistake as I did. Despite the pizza mishap, there is no way I won’t be eating here again, there are too many other wonderful menu items to keep me from coming back, but I am going to go with this brief closing sentiment. Go for the grilled items, blow off anything else (or risk extreme dissatisfaction). In short—burger, amazing. Pizza, lousy.